Even as Bangaloreans warm up to a new launch date, this time September, a Namma Metro train swerves towards KSCA stadium at Anil Kumble circle on M.G. Road, on a trial run in Bangalore on Thursday. 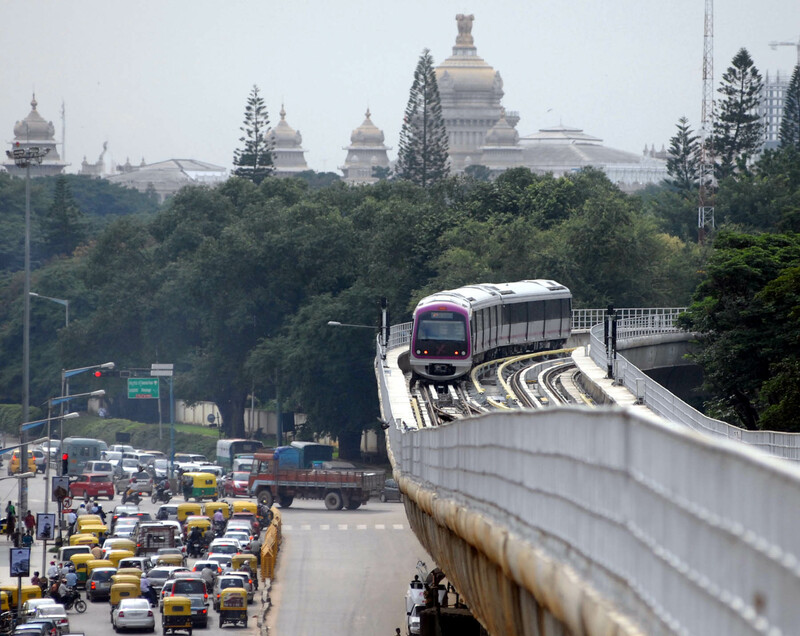 Also read: Why on earth does Bangalore Metro look so ugly? This entry was posted in Issues and Ideas, Mysore-Bangalore and tagged Anil Kumble Circle, Bangalore Metro, Churumuri, Karnataka Photo News, Karnataka State Cricket Association, KPN, KSCA, M.G. Road, Namma Metro, Sans Serif. Bookmark the permalink. ← Should ‘media corruption’ come under Lok Pal? Looks great, waiting for September 15th, hope they stick to the date. …and you are very happy! On a lighter note, Yedi is returning back as Cm after 6 months, as he claims, and going by the speed of the metro work, there are chances that its Yedi who will inaugurate! who is yeddy to inaguarate ??? His political career is finished. Can’t Wait to get on it. Now that the infrastructure is (almost) ready, can we have some architectects and horticulturists to suggest and implement a (non-commenrcial) beatification plan? Surely he will be in parapana agrahara, already talks have been held to denotify 5 acre nearby to house his good friends. I guess it will be something special to squat on this track, desi style, mmm…… That will be the true “beatification”. Yeddi has gone. Why unnecessarily drag him? This smacks of some cheap mentality. Now we may have to wait for Pm,presidents available dates and security arrangements.Its high time these inauguration events by politicians are stopped. Instead have the inauguration done by the workers of the project in a simple event and get the trains rolling. I don’t understand churumuri’s obsession with Yeddi. He has gone, why not leave it at that instead of dragging his name to everything? You can give a long list of endless people who won’t be inaugurating this. Everyone except the one person who will be inaugurating will not be inaugurating it!!! What is special about Yeddi? Yeddi and his sons are now waiting to get arrested anytime, forget about any inauguration! Of course, they have looted so much from the state that the ‘arrested and jailed drama’ will be very short lived, indeed. The transfer of Lokayukta DGP Pranob Mohanty had confirmed that the Sadandnanda Gowda-led BJP Government in Karnataka is completely remote controlled by Yeddi, Renukarcharya and crooked gang. In fact we can expect the strings being pulled from parapana agrahara!